In a recent post, I compared the Raspberry Pi 3B+ (RPi 3B+) in terms of wired iPerf performance against a few other popular Single Board Computers (SBCs). 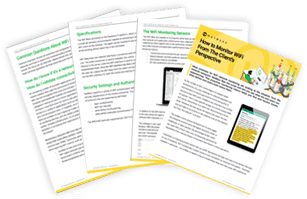 In this post, I will complete the network benchmarking by covering the iPerf performance of the onboard WiFi. The 3B+ came with a new WiFi antenna and support for 802.11ac which means 2.4 and 5.0 GHz connectivity. The WiFi chipset is the Cypress CYW43455 with a 1×1:1 configuration; the 3B model has the Broadcom BCM43438 chipset which is also 1×1:1 (but only has 802.11n at 2.4GHz). 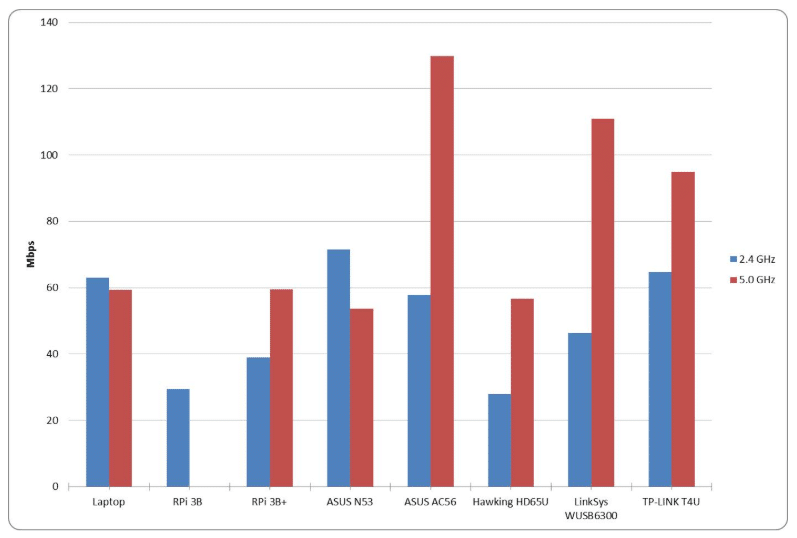 In summary, the 3B+ model brings the WiFi aspect of the RPi to the 802.11ac standard, which is a major improvement. The question now is ‘How does the 3B+ perform in terms of bandwidth?’. Of course, the WiFi performance of a device cannot be boiled down exclusively to how much bandwidth it can push. Nonetheless, this is a handy metric to assess the performance of WiFi device as a whole. I did a similar study when the 3B model came out two years ago but will expand on it to include the RPi 3B+’s performance. 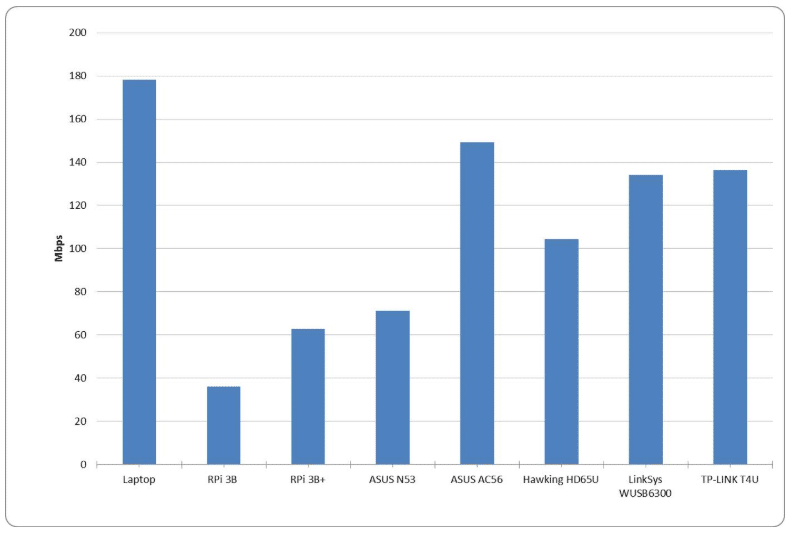 In a nutshell, in my 2016 iPerf bandwidth performance comparison, I compared the RPi 3B onboard WiFi against some popular USB WiFi dongles, including the ASUS N53, ASUS AC56, Hawking HD56U, the Linksys WUSB6300, and the TP-LINK T4U. In order to do a fair comparison, I replicated the set up that I used two years ago with the TP-LINK AC1750 as the WiFi router and took measurements at 15 feet Line of Sight (LOS) between the router and the 3B+ and at 60 feet (not in LOS) in the same lab. 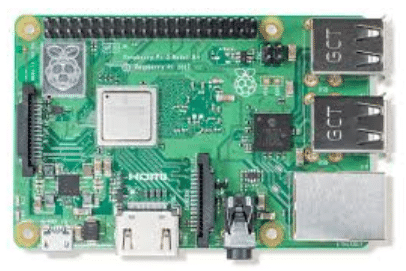 Note: The RPi 3 has Debian Stretch with Linux kernel 4.14.34-v7+ #1110 installed. I used iPerf version 2 between the RPi 3B+ and a Linux host that was connected to the router on its ethernet switch in order to isolate the WiFi connection between the 3B+ and the router for the measurements. Individual iPerf test measurements can vary for each run due to network conditions, CPU load and other factors – in order to remove this kind of noise, for each measurement, I ran ten iPerf tests and I averaged the results. The measurements on this plot are equal to the ones from the previous post, with the addition of the RPi 3B+ columns. We can see that the 3B+ achieves around 1.5x more iPerf bandwidth than the 3B model in the 2.4 GHz and around 2x as much bandwidth in 5.0 GHz; its performance is almost on par with the ASUS N53 WiFi dongle. However, it doesn’t come anywhere close to the best performing dongles such as the ASUS AC56 LinkSys WUSB6300 and TP-LINK T4U. The results are similar when comparing at 60 feet and not-in-LOS between the RPi and the router. 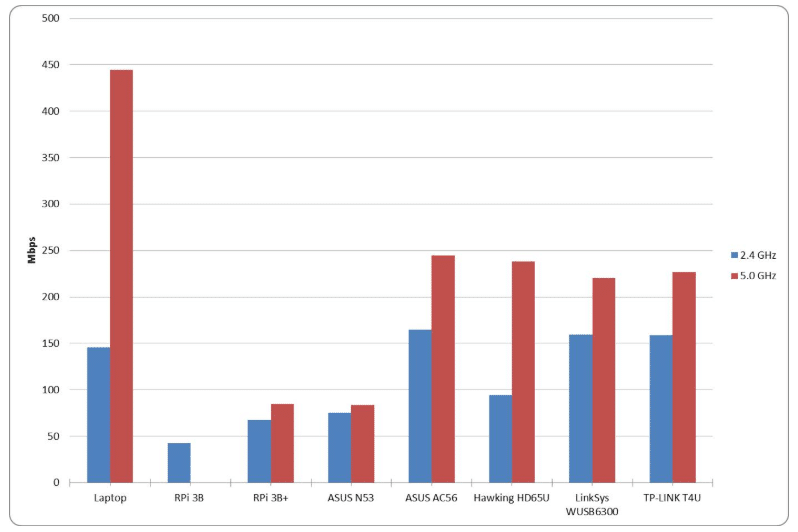 The 3B+ performs much better than the 3B, but achieves almost half the bandwidth of the 802.11ac WiFi dongles. The Hawking HD65U has an external antenna – it’s notable that the 3B+ performs better in both bands. 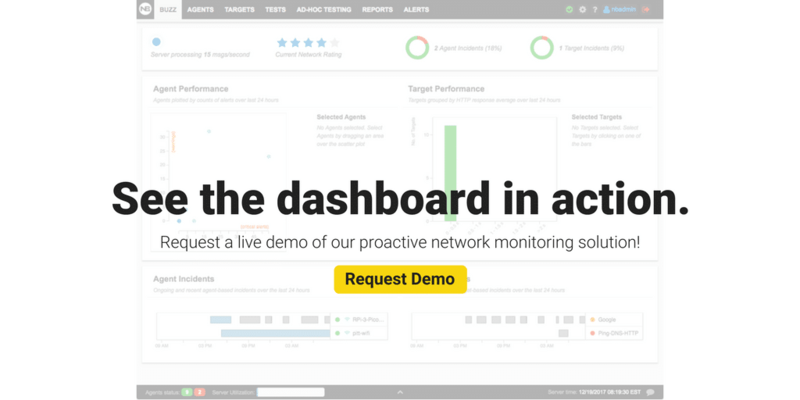 The overall performance is calculated by averaging the four iPerf tests for each platform. 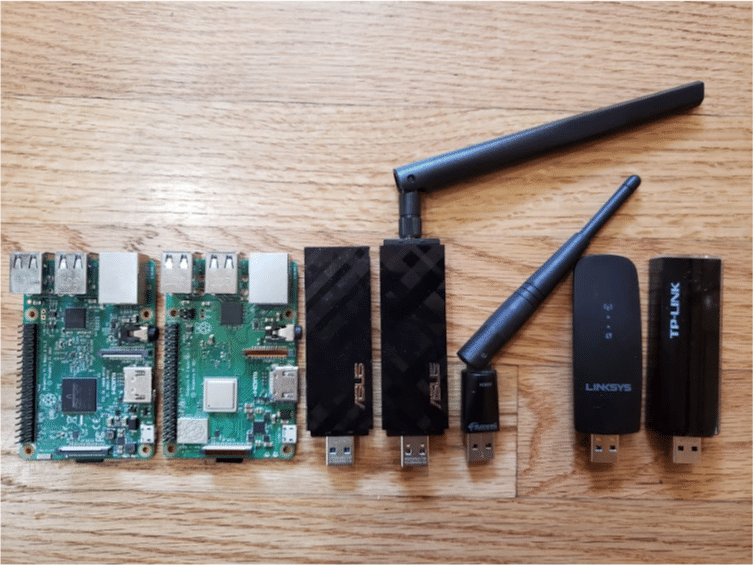 The RPI 3B+ is still not any better than using a USB dongle with an external antenna, but it has closed the gap significantly compared to the RPi 3B. Of course, you have to take into consideration that the external antenna comes at a cost and also changes the form factor of the device. With this post I conclude the network performance in terms of bandwidth for the RPi 3B+. The dual band 802.11ac is a major improvement, and I don’t think the Raspberry Pi Foundation will do any major improvements in the coming years regarding their WiFi specifications. 802.11ax is coming out just this year, and it will take a while until low cost devices such as the RPi catch up.